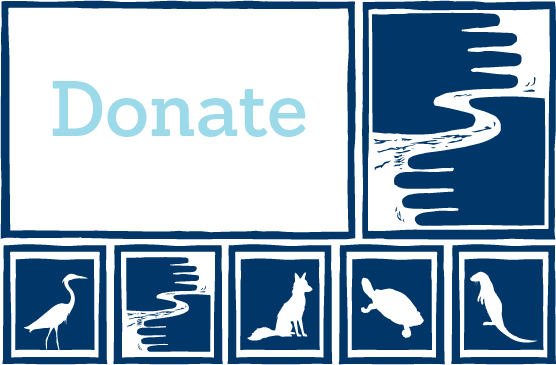 Check out our first mural for water quality! FMR worked closely with neighborhood groups and local artist Gustavo Lira to design St. Paul's first storm-drain mural. The koi fish represents Como Park Zoo & Conservatory, the music notes Como Dockside and the snapping turtle Como Lake. When you think of a storm drain, what do you see? The concrete of the street, perhaps a metal grate. How about a pathway to our local lakes or the Mighty Mississippi? Or a large beautiful painting that helps illustrate this connection with our local waters? Now you can check out such a work of art in the parking lot along Como Lake. The first of its kind in St. Paul, the storm-drain mural was painted Saturday, October 14 near the intersection of Lakeview Avenue West and East Como Lake Drive by Twin Cities artist Gustavo Lira. Although it only took a few hours to paint the mural is the result of over a year of collaboration between the artist, the neighborhood group, the city and FMR. We look forward to it prompting questions, educating people and inspiring behavior change for years to come. FMR and St. Paul have worked with youth and residents for years throughout the city to paint messages along storm drains about how they connect to the Mississippi: "Keep 'em Clean, Drains to River!" While stenciling storm drains and distributing related educational materials is known as an effective way to educate people, we wanted to try to reach an even broader audience. 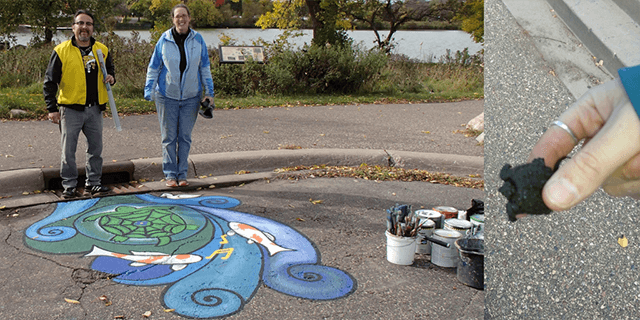 While the message is still the same — anything that goes down the drain ends up in our lakes, rivers and streams, harming our waters and wildlife — storm drain murals expand the idea of the stencils to an entire eye-grabbing picture. Left to right: Artist Gustavo Lira, FMR youth coordinator Kate Clayton and the baby snapping turtle that came to visit the mural — which features a full-grown snapper! — via a bucket of lake water drawn to clean brushes. We couldn't help but feel appreciated by the lake, to which we quickly returned the snapper. After reviewing examples from around the country, the mural was designed by Lira with input from the Como Active Citizens Network and funding from St. Paul. Lira is an artist, educator and activist based in Minneapolis. Originally from Mexico, he has been painting murals and working throughout Minnesota since 1999. He describes himself as a community-based [artist] "who believes in the power of the collective to increase our voices." Currently, Como Lake is impaired for salt and phosphorous, both of which travel from stormdrains into the lake in the forms of sidewalk salt, fertilizer and leaves left in the street. Lira is confident this work of art will bring more attention to the problem and help people understand how what we put on our streets and lawns impacts our waters; inspiring more neighbors to adopt the drains, prevent runoff from their properties. Although the mural was painted in just a few hours, the process of its creation began with conversations back in spring 2016. In addition to Gustavo, many individuals and organizations worked hard to pull it all together. We're sure we're missing many important people, but we'd like to thank Tracy Levenworth for sharing photos and ideas of storm drain murals from around the country, funder St. Paul Public Works and project manager Pat Murphy, the Como Active Citizens Network and network point-person Janna Caywood, District 10 Como Council board member and Environmental committee chair Mike Ireland, and St. Paul Parks and Recreation's Eric Thompson. Though the storm drain stenciling season is coming to an end, FMR works year-round offering water-focused lessons to area teachers; bringing water-focused lessons into the classroom. Engaging and core-standards meeting presentations are available on watersheds, wetlands, erosion, and invasive species. For more information about stenciling or classroom programs contact FMR Youth Coordinator Kate Clayton at kclayton@fmr.org.